All solar cells are made from at least two different materials, often in the form of two thin, adjacent layers. One of the materials must act as an electron donor under illumination, while the other material must act as an electron acceptor. If there is some sort of electron barrier between the two materials, the result is an electrical potential. If each of these materials is now provided with an electrode made from an electrically conductive material and the two electrodes are connected to an external load, the electrons will follow this path. The most commonly used solar cells are made from thin wafers of polycrystalline silicon (polycrystalline cells have a typical “frosty” appearance after sawing and polishing). The silicon is very pure, but it contains an extremely small amount of boron as a dopant (an intentionally introduced impurity), and it has a thin surface layer doped with phosphorus. This creates a PN junction in the cell, exactly the same as in a diode. When the cell is exposed to light, electrons are released and holes (positive charge carriers) are generated. The holes can recombine with the electrons. The charge carriers are kept apart by the electrical field of the PN junction, which partially prevents the direct recombination of electrons and holes. The electrical potential between the electrodes on the top and bottom of the cell is approximately 0.6 V. The maximum current (short-circuit current) is proportional to the surface area of the cell, the impinging light energy, and the efficiency. Higher voltages and currents are obtained by connecting cells in series to form strings and connecting these strings of cells in parallel to form modules. The maximum efficiency achieved by polycrystalline cells is 17%, while monocrystalline cells can achieve up to 22%, although the overall efficiency is lower if the total module area is taken into account. On a sunny day in central Europe, the available solar energy is approximately 1000 W/m2, and around 150 W/m2 of this can be converted into electrical energy with currently available solar cells. Cells made from selenium, gallium arsenide, or other compounds can achieve even higher efficiency, but they are more expensive and are only used in special applications, such as space travel. There are also other approaches that are aimed primarily at reducing costs instead of increasing efficiency. The objective of such approaches is to considerably reduce the amount of pure silicon that has to be used or eliminate its use entirely. One example is thin-film solar cells made from amorphous silicon, which have an efficiency of 8 to 10% and a good price/performance ratio. The silicon can be applied to a glass sheet or plastic film in the form of a thin layer. This thin-film technology is quite suitable for the production of robust, flexible modules, such as the examples described in this article. From an electrical viewpoint, an ideal solar cell consists of a pure current source in parallel with a diode (the outlined components in the accompanying schematic diagram). 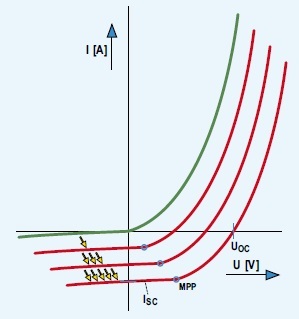 When the solar cell is illuminated, the typical U/I characteristic of the diode shifts downward (see the drawing, which also shows the opencircuit voltage UOC and the short-circuit current ISC). The panel supplies maximum power when the load corresponds to the points marked “MPP” (maximum power point) in the drawing. The power rating of a cell or panel specified by the manufacturer usually refers to operation at the MPP with a light intensity of 100,000 lux and a temperature of 25°C. The power decreases by approximately 0.2 to 0.5 %/°C as the temperature increases. A battery can be charged directly from a panel without any problems if the open-circuit voltage of the panel is higher than the nominal voltage of the battery. 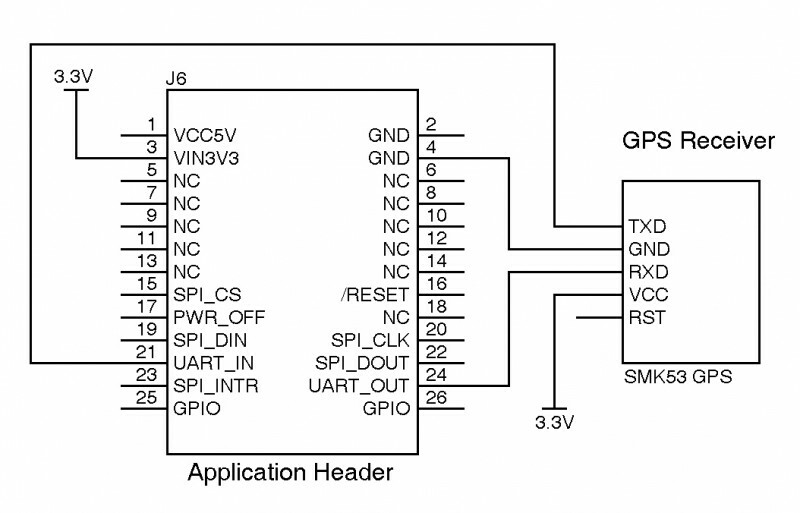 No voltage divider is necessary, even if the battery voltage is only 3 V and the nominal voltage of the solar panel is 12 V. This is because a solar cell always acts as a current source instead of a voltage source. If the battery is connected directly to the solar panel, a small leakage current will flow through the solar panel when it is not illuminated. 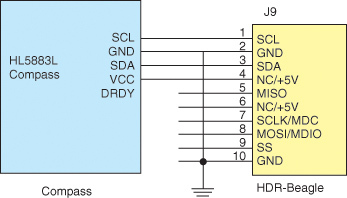 The can be prevented by adding a blocking diode to the circuit (see the schematic). Many portable solar modules have a built-in blocking diode (check the manufacturer’s specifications). This simple arrangement is adequate if the maximum current from the solar panel is less than the maximum allowable overcharging current of the battery. NiMH cells can be overcharged for up to 100 hours if the charging current (in A) is less than one-tenth of their rated capacity in Ah. 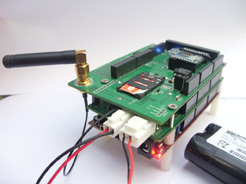 This means that a panel with a rated current of 2 A can be connected directly to a 20-Ah battery without any problems. However, under these conditions the battery must be fully discharged by a load from time to time. 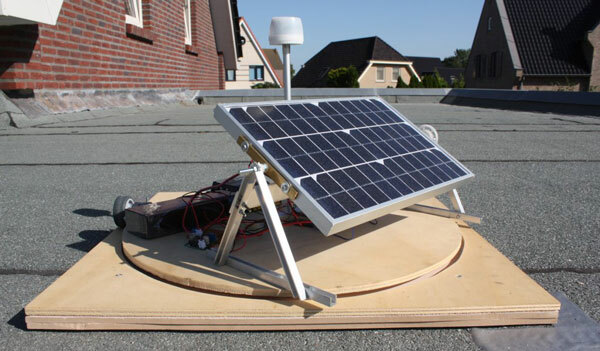 When positioning a solar panel, you should ensure that no part of the panel is in the shade, as otherwise the voltage will decrease markedly, with a good chance that no current will flow into the connected battery. Most modules have integrated bypass diodes connected in reverse parallel with the solar cells. These diodes prevent reverse polarization of any cells that are not exposed to sunlight, so the current from the other cells flows through the diodes, which can cause overheating and damage to the cells. To reduce costs, it is common practice to fit only one diode to a group of cells instead of providing a separate diode for each cell. MARY: Where do you live and what is your current occupation? SCOTT: I live in Los Gatos, CA, and I’m a senior director at Jasper Wireless, a company providing machine-to-machine (M2M) data communications services. I have been with Jasper since the beginning in 2005 when the company started with four people and a plan. Now Jasper is approaching 150 employees and we are a global company. I have served many roles at Jasper, working on location technology, device middleware, back-end reporting, and front-end software. My other job is as an inventor at Taft Instruments. We are just now forming around the technology I developed for the RL78 design challenge. We are finding there is a big need for this solution in the solar industry, which is poised for tremendous growth in the next few years. MARY: How did you first become interested in embedded electrical design? What is your educational background? SCOTT: I started working for my father at his startup in the basement of our home in Long Island when I was a teenager (child labor laws were more lax back then). 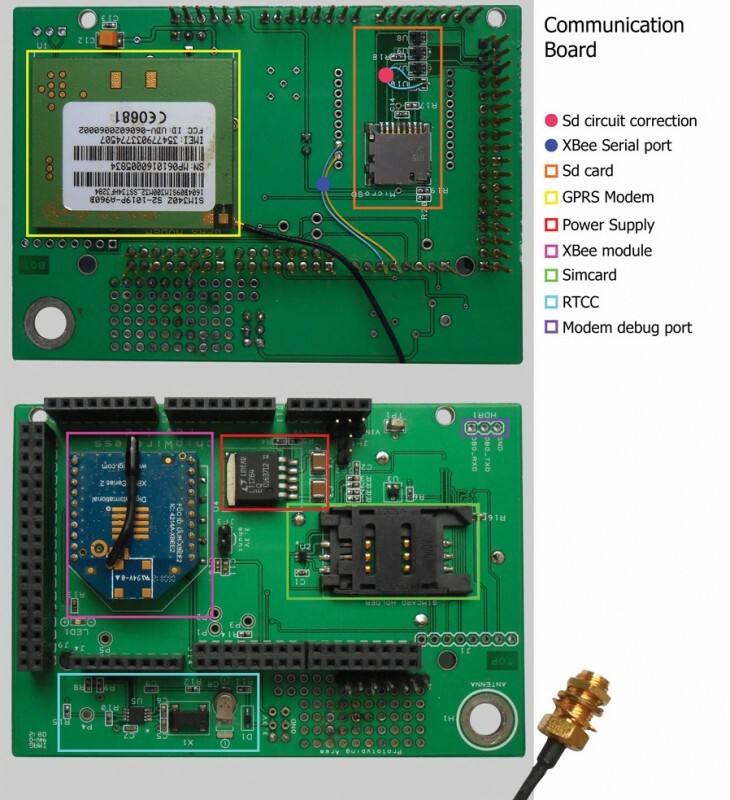 We were doing embedded electronics design along with mechanical modeling and prototyping. I learned from the best and it has stuck with me all these years. I went on to get a BSEE from Tufts University and I toyed with the idea of business school, but it never gripped me like engineering. 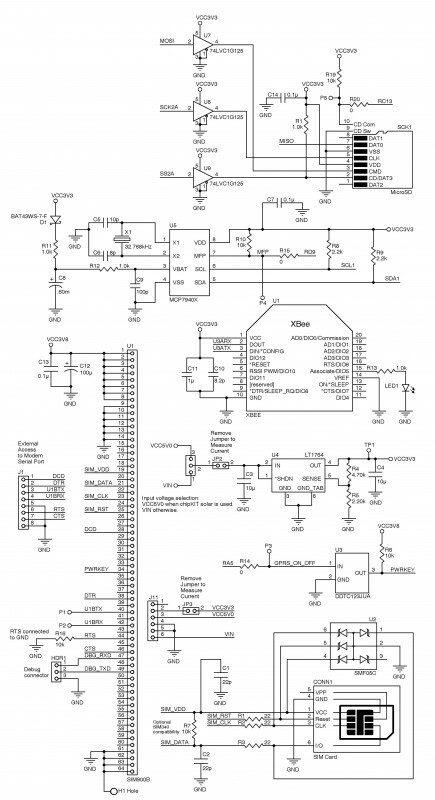 MARY: Why did you enter the 2012 Renesas RL78 Green Energy Challenge? What about its focus appealed to you? SCOTT: The green energy design challenge came along at the perfect time. I had been working on the cleaning robot for a few months when I saw the challenge. 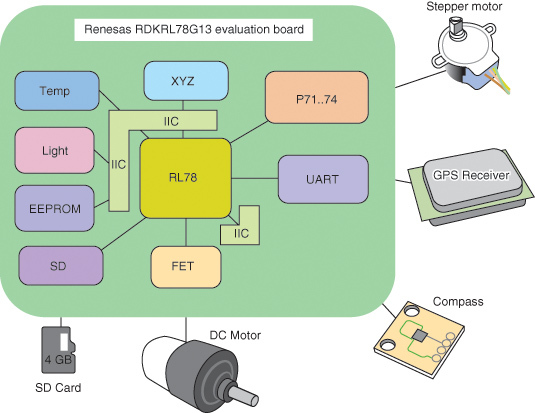 The microcontroller I had originally picked was turning out to be not a great choice, and the challenge made me take a look at the RL78. The part was perfect, and the challenge gave me a goal to work toward. MARY: How did the idea of designing a robot to clean solar-tracking mirrors (i.e., heliostats) for solar power plants come to you? SCOTT: I can’t say it came to me all at once. I have participated in solar technology development sporadically throughout my career, and I have always tried to stay abreast of the latest developments. After the lessons learned from the parabolic trough concentrators, the move to high-concentration concentrating solar power (CSP) plants, which more efficiently convert solar power to electrical power, struck me as the right thing to do. The high-concentration CSP plant utilizes hundreds of thousands of mirrors spread over many acres. The mirrors reflect sunlight onto a centrally located tower, which creates intense heat that drives a steam turbine generator. The efficiency gains from the higher temperatures will make this the dominant technology for utility scale power generation. But there is a high maintenance cost associated with all of those mirror surfaces, especially in environments where water is scarce. A number of people have realized this and proposed various solutions to keeping the surfaces clean. Unfortunately, none of the proposed solutions will work well at the scale of a large utility plant. I experimented with quite a few waterless cleaning techniques before coming back to electrostatics. It was my wife, Dia, who reminded me that NASA had been cleaning dust off panels on space missions for years using electrostatic principles. She convinced me to stop working with the forced-air concept I was doing at the time and switch to electrostatics. It was definitely the right choice. MARY: What does the system do? What problems does it solve for power plants? How is the device different from what is already available for the task of cleaning heliostats? Most of the competing products have a long installation time and require some external wiring and maintenance. These can be logistical problems in a field of hundreds of thousands of mirrors. Our device is also unique in that it cleans continuously. This prevents accumulation of organic materials on the surface, which can mix with dew and make a bio-film on the surface. That film bakes on and requires vigorous scrubbing to remove. We also have a feature to handle the dew, or frost, if it’s present. MARY: What were some of your design challenges along the way and how did you address them? SCOTT: They were numerous. The first challenge was the power source. It is important that this device be entirely self-powered to avoid having to install any wiring. I had to find a solar-panel configuration that provided enough power at the right voltage levels. I started with lower voltages and had a lot of trouble with the boost converters. I also couldn’t use any battery storage because of the life requirement. This means that everything has to operate intermittently, gracefully shutting down when the sun fades and then coming up where it left off when the sun returns. The next challenge was the mechanical drive. This had to grip the mirror tightly enough to resist a stream of water from a cleaning hose (infrequent cleaning with water will probably still be performed). And it had to do this with no power applied. Another big challenge was the high-voltage electronics. It turns out there is little off-the-shelf technology available for the kind of high-voltage circuitry I needed. Large line output power transformers (LOPTs) for old cathode ray tubes (CRTs) are too large and expensive. Some of the resonant high-voltage circuits used for cold cathode fluorescent lighting (CCFL) can be used as building blocks, but I had to come up with quite a few innovations to be able to control this voltage to perform the cleaning task. I had more than a few scorched breadboards before arriving at the current design, which is very small, light, and powerful. MARY: You recently formed Taft Instruments (click here for Taft website). Who are the players in the company and what services does it provide? SCOTT: We formed Taft instruments to commercialize this cleaning technology. We have been very fortunate to attract a very talented team that has made tremendous progress promoting the company in industry and attracting investment. We have Steve Gluck and Gary Valinoti, both highly respected Wall Street executives who have galvanized the company and provided opportunities I could never have imagined. They are now recruiting the rest of the team and we are talking to some extremely qualified people. And of course my wife, Dia, is making numerous contributions that she will probably never get credit for. MARY: How’s business? How would you describe the market for your product and the potential for growth and reach (both domestically and globally)? SCOTT: We are not at the commercial deployment stage just yet. Our immediate focus is on the field trials we are starting with a number of industry players and the US Department of Energy National Laboratories. We fully expect the trials to be successful and for our large-scale rollouts to begin in about a year. The market potential for this is tremendous. I’m not sure anyone fully realizes yet the global transformation that is about to take place. Now that the “grid parity” point is near (the point where the cost of solar power is competitive with fossil fuels), solar will become one of the fastest-growing markets we have seen in a century. Entire national energy pictures will change from single-digit percentages to being dominated by solar. It is a very exciting time in the solar industry, and we are very happy to be part of it. MARY: Are you individually—or is your company—developing any new designs? If so, can you tell us something about them? SCOTT: Yes. I can’t say much, but we are working on some very interesting new technologies that will improve on the electrostatic cleaning principles. This technology will vastly expand the base that we can work with. MARY: You describe yourself as a “serial entrepreneur” with a strong technical background in electronics, software, hardware, and systems design. That combination of skills comes in handy when establishing a new business. But it also helped you land your day job eight years ago as Director of Location Technology at Jasper Wireless. What do you see as future key trends in M2M communications? SCOTT: M2M has really taken off since we began in 2005. Back then, there were only a few applications people had envisioned taking wireless. That list has exploded, and some analysts are predicting volumes of M2M endpoints that exceed the human population by tenfold! We have seen large growth in a number of different verticals over the years, the most apparent one right now being automotive, with all the car companies providing connected services. Jasper is uniquely positioned to offer a global solution to these companies through our carrier partners. MARY: Over the years, you have gained expertise in areas ranging from embedded electronics and wireless, to applications of the global positioning and geographic information systems (GPS and GIS). What do you enjoy most and what are some career highlights? Is one your involvement in the development of a GPS for the New York fire department’s recovery operations after the collapse of the World Trade Center? SCOTT: What I enjoy most is working with motivated teams to create compelling products and services. One of my proudest moments was when our team at Links Point rose to the 9/11 challenge. At the time, I was a founder and the chief technology officer of Links Point, which provided GPS and location mapping. When the request came from the New York fire department for a solution to locating remains at the recovery site, the team dedicated themselves to providing a solution no first responder had ever had access to previously. And we did that in record time. We had to come up with a proposal in a half-day and implement it within three days. You have to realize that GPS and PDAs were very new at the time and there were a lot of technical challenges. We also had to compete with some other companies that were proposing more accurate surveying equipment, such as laser ranging. Our product, a PDA with a GPS attachment, won out in the end. The advantages of our handheld devices were that they were rugged and that firefighters could easily carry them into Ground Zero. We got the opportunity and honor of serving the FDNY because of the extreme talent, dedication, and professionalism of my team. I would like to mention them: Jerry Kochman, Bill Campbell, Murray Levine, Dave Mooney, and Lucas Hjelle. MARY: What is the most important piece of advice you would give to someone trying to make a marketable product of his or her design for an electrical device? Editor’s note: For more details, schematics, and a video of Scott Potter’s solar-powered electrostatic cleaning robot, click here. Interested in engineering your own solar panel system installation? If so, you’ve likely begun researching photovoltaic technology, construction materials, and test equipment on the Internet. Have you been satisfied with the information you’ve found? Probably not. There’s simply a scarcity of reliable electronics engineering advice out there about serious solar panel installation projects. Enter Circuit Cellar. Over the past several years, we’ve published articles by professional engineers about their own installations. “First, I’m an engineer—and an electrical one at that (except my degree is so old that it reads “DC ONLY!”). In addition, my neighbors in New Mexico already have systems up and running. Jeff and Pat live up the road in a handmade log home. Jeff is a former engineer for General Motors (Pontiac GTO, Avanti, and Saturn to his credit). That makes for some interesting discussions about how electronics will revolutionize the car industry, but I digress. He’s a mechanical engineer who doesn’t fully embrace all of this electrical stuff. He has a minimal system with four panels of about 150 W each. Another neighbor’s system has about 3 kW of panels. Armed with the idea that it could be done, I started to match up equipment with our requirements. The equipment I selected falls into four main categories: solar panels, inverters, charge controllers, and batteries. In fact, you could consider each independently and not get too far off an ideal system. There are, however, some areas of concern when mating equipment from different manufactures, so I stayed with one manufacturer for the control devices. Solar panels convert solar energy into electrical energy. Again, there is a lot of literature available about how this is accomplished. But what about some hard code conversion details? Standard test conditions require a temperature of 25°C and an irradiance of 1,000 W/m² with an air mass of 1.5 (AM1.5) spectrum. They correspond to the irradiance and spectrum of sunlight incident on a clear day on a sun-facing 37° tilted surface with the sun at an angle of 41.81° above the horizon. This condition approximately represents solar noon near the spring and autumn equinoxes in the continental U.S. with the surface of the cell aimed directly at the sun. Thus, under such conditions, a solar cell with a 12% efficiency and a 100 cm2 (0.01 m2) surface area can be expected to produce approximately 1.2 W of power. This gives you an idea of what’s involved in rating and selecting solar panels. Look at the University of Western New Mexico’s weather site for solar radiation and you’ll get a feeling for the actual solar radiation for the area. There is another consideration when selecting a panel, namely cost per watt. If you start looking, you will find panels of different wattages and different prices. In March 2004, I started a spreadsheet listing panels from 125 to 195. Note pricing from March 2004, purchased equipment in 2005, installed in 2006–2007, and operational in October 2007. Then, I added the costs different suppliers were charging for each panel and calculated a price/watt number. My results range from $4.35 to $4.76 per watt. I estimated that I would need 3,000 W of panels, and came up with $13,320 for the cost of the BP Solar SX 170B. More polysilicon is currently being used in solar panel manufacturing than all other usages combined, so this is big business. It also seems that the larger-power-rating panels command a higher price per watt. It is sort of like the CPU business where chips are speed graded and priced accordingly. My cost estimates are a bit old, so you’ll need to run the numbers with today’s prices. Let me add that I found solar panels to be in tight supply, so when you begin your design, look to secure the panels at a good price early in the game. The 3,000 W in my design was derived from the sun’s availability in the winter. Figure 2 represents the solar radiation for an actual cloudless winter day. The peak radiation is 600 W/m2. Let’s estimate that the shape of the curve is a sine function so that the area under the curve is its average value (2/pi, or 0.6366 times the peak value) multiplied by its width. So, that is 600 W/m2 × 0.6366 × 8 h (9 A.M. to 5 P.M.), or 3,055.7 Wh/m2. Therefore: Close to 10 kWh per day is good enough for the workshop, but not enough for the house when it’s built. And 3 kW of panels is what one neighbor is using. We also need to account for cloudy days. The energy to run the workshop would need to come from the battery or backup generator. Another concern is hot summer days when the panel efficiency drops because of the heat. But the days are longer in the summer. Actually, it’s still a 24-hour day, but there is more available sunlight each day. I don’t have test results for summer generation (because I’m writing this in February 2008 after getting the system put together in October 2007), so stay tuned. The last point to watch out for in panel selection is cold weather open-circuit voltage going into the charge controller. In the cold, with no current drawn, the open-circuit voltage of the solar panel will rise. 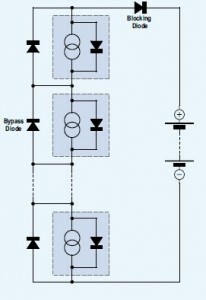 If several panels are connected in series (for efficiency), this voltage may damage the input to the charge controller. This is a well-known situation and your equipment dealer will be able to guide you in this area. I must confess that I find inverters boring. They are not as exciting as solar panels, charge controllers, or even batteries. I thought I would not find much difference in available inverters and that probably was due to my lack of enthusiasm. I selected inverters from OutBack Power Systems. I wanted the inverter/charge controller combination to be from one manufacturer. As I looked at the literature, OutBack seemed to have covered all of the issues for my installation. I ended up with two OutBack VFX3648 inverters (see Photo 2). They are 3.6 kW (continuous) with connections for a 48-V battery and vented. You will find vented and sealed inverters. I selected vented because they typically have a larger power rating and I’m not in a harsh environment. Also, the inverters are located in an area that is protected from the elements. Another option is a fan on the inverter. The fan also gives you more capacity, but what will you do when the fan fails, and you know it will? Our system is a normal 220-V home application. So, there are two inverters, one for each phase. OutBack has a neat option that includes a transformer to supply the second phase so the second inverter can remain in a low-power operating mode. When the power requirements become large enough, the main inverter will signal the second (slave) inverter to start up and handle the increased load. This is a good setup for our application. We can install a normal commercial heating/cooling system and power up only the second inverter when the load is calling for it. Click here to read the entire article series.